This chart from the STU captures their bullish count, and it has been the one I have been watching in my Last Chance posts here and here. This count has us in a minor wave iv. In my Thursday post I was wondering if it would break as a flat or triangle. It appears to have done a flat, with today’s gap down at the open the final C wave. If so, it should take off at the open tomorrow in wave v.
This minor wave iv and v will complete the wave structure from early Sept. As seen in this chart, wave i was longer than wave iii. Normally third waves are the longest and strongest; but the hard rule is that they cannot be the shortest, or the count is wrong. This rule puts an upwards cap on the final wave v: it cannot break SP1097 nor Dow10450. So the Dow can crest 10K but the S&P needs to fall short of 1100. Also, in an impulse wave which runs in the direction of trend, either the third or fifth waves normally extend. The extension can be seen as the herd piling on in increasing enthusiasm (or panicking in an impulsive fall). In this case the first wave may turn out to be the longest, which is another indicator that this is a rally running out of steam, not extending with enthusiasm and increasing volume. Now, the bearish STU count has a really small i and ii waves, which makes it suspect. 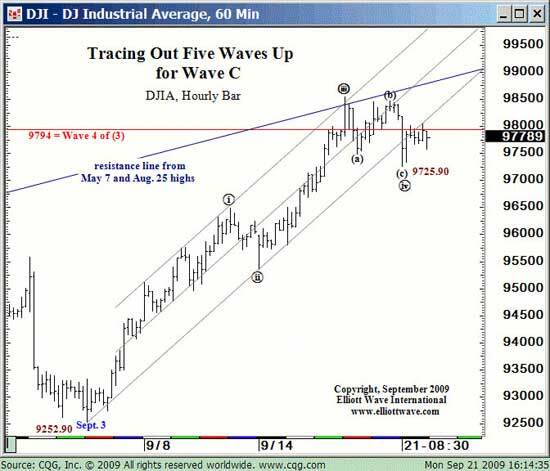 An alternative count from Daneric makes wave iii the longest and would permit the wave v to run. Keep this in mind since if we break Dow10K the market may run to the 50% retrace of Dow10.33 and SP1121.